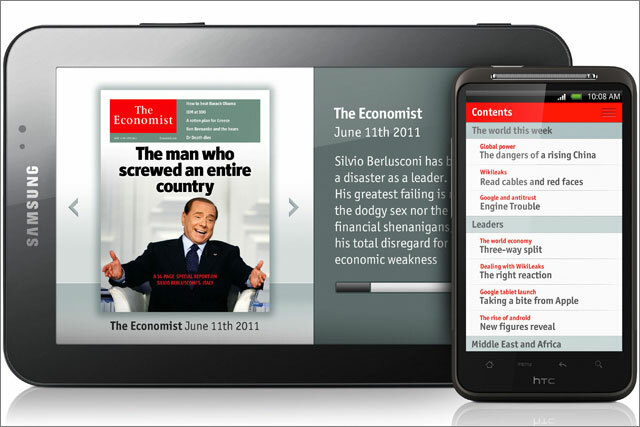 The Economist has launched an app for Android devices, after reaching 2.4million downloads for its iPhone and iPad apps. The app is available to download for free from the Android Market, but users without a subscription to the magazine or website will only have access to the editor’s top six must-read articles. Economist print or digital subscribers will be able to access each issue in full from 9pm each Thursday, while non-subscribers can pay £3.99 to download an edition. Its iPhone/iPod Touch and iPad apps, launched in November last year, are also free to download, but cost £3.49 an edition for non-subscribers. The two apps are accessed on a combined total of almost 700,000 unique devices a month. Oscar Grut, managing director of Economist digital editions, said: "We are delighted with these numbers and also with the feedback from our readers. Our Android app provides the same exceptional reading experience. "As I’ve said before, we want our readers to be able to read us wherever and however they want, and we will continue to develop for platforms and mobile devices capable of delivering the unique Economist weekly reading experience, free from distractions." The app, built by TigerSpike, is available on all Android devices and small or medium tablets running a 2.x. operating system. An annual digital subscription to the Economist costs £119.99, or £29.99 per quarter. The cost of combined print and digital subscriptions varies by region and starts at £102 per year. The Economist has also launched an app based on its World in Figures section for the iPad and iPhone today. This allows users to access data and statistics from more than 190 countries from transport to cinema. The app is available globally and can be downloaded from the Apple iTunes store for 69p.